Jasmin is our largest two bedroom apartment (one twin, one double) featuring en-suite bathroom and shower, lounge, kitchenette and private outdoor terrace. 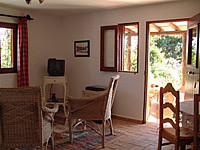 All rooms have full central heating and come equipped to a very high standard. Each apartment/bedroom has been carefully thought out to make your stay with us as comfortable as possible. 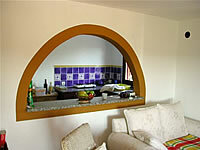 All our accommodation has satelitite TV and DVD player. Maid service is available 5 days a week. Towels and linen are included in the price. Laundry service is available upon request as is baby sitting. 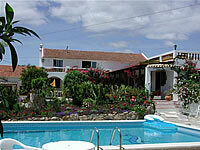 WE have a wonderful pool area for you to enjoy and relax. The pool it self is 10m by 5m and is salt water. This eliminates all does nasty odours, smells, eye redness and skin irritations associated with chlorine pools. The pool is also heated to make your swim that more enjoyable. Up on our first terrace we have installed a state of the art Hydro massage Jacuzzi. Specifically placed up high so as to enjoy the wonderful views, this is the perfect way to relax aching muscles and de-stress. WE have also placed a children’s play ground adventure with slides, swings, climbing frame, rope ladders and a see saw. This is located conveniently close to the cabana and the swimming pool so parents can keep an eye on their little ones. The western Algarve is a haven for water sports. With Lagos marine only 10 mins drive away deep sea fishing, dolphin seeing, yacht charters and day tripping on old fishing boats through the amazing rock tunnels along the lagos coastline is available. We are able to organise horse riding for our guest with Vale De Ferro a local stable with an excellent reputation. From beginners through to experienced riders we are able to organise for you a memorable experience that will make your stay at Quinta Das Achadas that more special. ALL PRICES ARE PER WEEK AND INCLUDE BREAKFAST.